Jojje Sundblad and Sebastian Tuma Fischer have been awarded for the excellent quality of their master thesis, run in collaboration with PDRL research partner Dynapac. 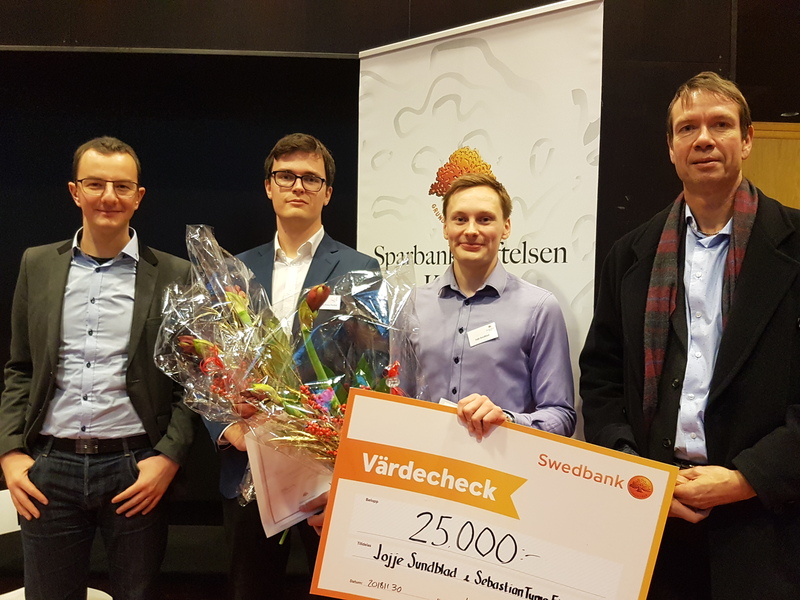 Jojje and Sebastian have received the award together with a 25.000 sek scholarship in the yearly event sponsored by Sparbanksstiftelsen Kronan at BTH. Their work has been selected among 68 candidate theses by a jury composed by representatives from Sparbankstiftelsen Kronan and experts from BTH. The selection criteria were based on the high creativity of the work, the introduction of new technology, the practical relevance, the advancement in technology, the business potential and the high contribution to society in the field of welfare and health. The thesis project was carried out together with PDRL research partner Dynapac in collaboration during the MD3S – Model Driven Development and Decision Support profile project.